On the 21st of September 2010, many reports appeared on the Internet about computer simulations that could explain the parting of the Red Sea by God, through Moses as recorded in Exodus in the Holy Bible. "New computer simulations have shown how the parting of the Red Sea, as described in the Bible, could have been a phenomenon caused by strong winds. The account in the Book of Exodus describes how the waters of the sea parted, allowing the Israelites to flee their Egyptian pursuers. 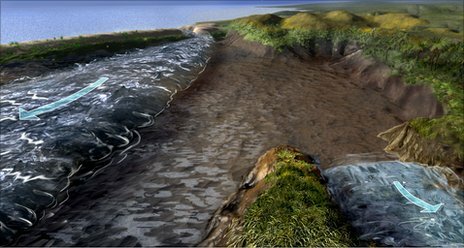 Simulations by US scientists show how the movement of wind could have opened up a land bridge at one location.This would have enabled people to walk across exposed mud flats to safety. The results are published in the open-access journal Plos One. The researchers show that a strong east wind, blowing overnight, could have pushed water back at a bend where an ancient river is believed to have merged with a coastal lagoon." I use a computer. I Skype. I am a believer in a lot of scientific breakthroughs. Therefore I am not one to sniff at science. There are however some scientific arguments that border on a bit of ridiculousness. Let us assume that in a science laboratory, at a given time, scientists simulate, I repeat simulate, wind conditions and try to use these to explain the parting of the Red Sea. Some questions come to my mind immediately. First, Moses led the Israelites to the lip of the Red Sea, with the Egyptians in pursuit. How did Moses know the precise moment that the strong east wind would blow and part the water, in order to point his rod at the water and say, 'behold the power of the Lord'? How did he know this? Second, Moses crossed the water with men, women, children, animals and their properties. Is it not interesting that the wind held the water and kept it parted until the Israelites had all crossed before the wind ceased and the water flowed back in, drowing the Egyptians? I am not arguing with the suggestion that strong winds caused the parting of the Red Sea. My quarrel is with the suggestion that the parting of the Red Sea was not a miracle delivered by God through His servant Moses for his people. God has power over all the elements He created including the winds and the waters. It is therefore possible that when Moses obeyed and pointed his rod at the sea, God sent a strong East wind at that material time to blow the water apart, and when His people had safely crossed, He stopped the wind. If the scientists want to prove that it is not something awesome wrought by God's hands, let them get out of the laboratory, stop simulating and go to the sea, any sea, at a given time and ask it, or make it part for a specified length of time. It is sad really that there are people out there who are obsessed with disproving everything that forms the basis of Christian faith. The wonderful thing about some of these efforts is that they end up justifying what they attempt to undermine. will raise a strong wind for you. standing between you and the job of your dreams. with the power above all powers. My Daily Communion with the Almighty God of my life. The Lord is my shepherd. I have no difficulty in paying for a roof over my head, affording my transportation, food, clothing and other necessary expenses required to provide abundantly for my family. I lack nothing at all. I have no physical ailments. My body is fundamentally healthy. I soar in divine health. He makes me lie down in green pastures where there is abundance of fruitfulness and blessings for me and my family. I am a success. He leads me beside the still waters thereby giving me peace of mind, peace of spirit, and the courage to face life with calmness, clear headedness and purpose. I do not rush into decisions and I do not speak too quickly, I only do those things which the Lord desires and asks of me with the sense of direction that comes with spiritual serenity. I surrender to His will and guidance. He leads me in the paths of righteousness for His name’s sake. He keeps me on the side of what is right. He makes me aspire towards holiness. He makes me realise that I live only to worship Him and by my every word, every thought and every action bring honour and glory to His Holy name. I worship Him. Yes, even though I walk through the valleys of the shadow of death, I shall fear no evil for the Lord is with me. I live without fear in everything I do – driving, travelling by public transport, walking in the streets where terrorists and criminals operate, visiting the infirm in the hospitals where unseen bugs prowl, I am never afraid because I am covered completely with the blood of my Lord Jesus the Christ. I wear the armour of God. Your Rod and your staff, they comfort me. There is no grief in my life. In my times of despair. In my times of sorrow. In my times of confusion. God is the rock within which I take refuge, where nothing can ever hurt me, where neither words of detractors, nor the snares of principalities and powers can hurt me or even come near me. You have put a hedge around me. You prepare a table before me in the presence of my enemies. Where people expect me to fail, I triumph. Where people expect me to fall, I stand. Where people expect me to mourn, I celebrate. You are good and faithful to me, because I do your will and meditate on your law, day and night. You have fortified me with your spirit and your grace. You have blessed me. You make a way where there is no way, heavenly father. You give me business where there is no business. You make me achieve every target I set for myself. I never fall short because I am in you and you in me. My cup truly overflows. Surely, goodness and mercy shall follow me, all the days of my life, and I shall dwell in the wondrous house of the Lord for ever and ever. Amen.